The Monochrome Madonna, the third book in the popular Lalli mystery series, begins with a strange, unexpected phone call, and a gruesome death. As the story unfolds, retired detective ‘L. R.’ Lalli uses her considerable skills to solve a baffling crime — a murder without a motive. The novel deals with the secret lives of people, raises some pertinent questions about love and hatred, and makes you wonder: Do we ever really know anyone? Author Kalpana Swaminathan spoke to us about Madonna, her creative process, and the next Lalli mystery. Read on for excerpts from the interview. The Monochrome Madonna book cover; courtesy of Penguin Books India. How long does it take you to write a book like The Monochrome Madonna? What kind of research goes into it? Ah, the White Rabbit quizzing me, stop-watch in hand? I really must hurry, then! The truth is — I never do. If I’m happy with the first draft of a book, I let it alone for a while — a week, a year, two years, who knows? If it works the second time around, great! If it doesn’t, I let it footloose and eventually it comes back, a prodigal to be nurtured! But a timeframe doesn’t work for a book, not for a good one — it must find its space and its freedom. The Monochrome Madonna didn’t take any research. It’s an “observed” book, where everything works through interaction between the characters and the fun of narration. This is in contrast with our (Ishrat Syed and Kalpana Swaminathan writing as Kalpish Ratna) novel The Quarantine Papers which took a great deal of excavating from archived documents and personal papers. Monochrome turns on the eternal question: How well do we know each other? — and there’s no researching that! Would you describe yourself as prolific? Do you write every day? I never describe myself — I prescribe a crash diet of Edward Lear for anyone prone to do so. Do I write every day? Not so as you’d notice. 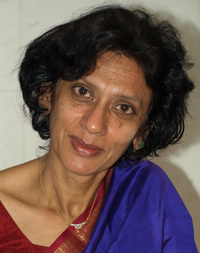 Kalpana Swaminathan. 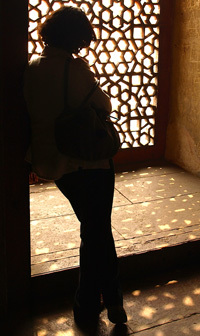 Photograph by Ishrat Syed. What made you want to become a writer? What were some of your earliest stories about? If you had to choose between omniscience and the ability to ask the right questions at the right time, which would you pick? The second, naturally! Omniscience is so boring, besides being a public nuisance. What tools do you use to write? Do you prefer pens and notebooks, typewriters, or laptops? I used to be a completely cyber-challenged till I discovered the iMac in 1999 — never looked back. And it just gets better — I’m the kind of person who argues with a computer, and my G5 is patient and forbearing. I like to write longhand when I’m away from my desk — pencil on paper works best for me always. Describe a ‘typical’ day in the life of Kalpana Swaminathan. If I could, I’d probably wouldn’t wake up next morning. I lead an incredibly surprising life, and six impossible things always happen to me before breakfast. Are you still a practising paediatric surgeon? Have there been any instances of people coming to your office, not to present you with medical cases, but to talk about your books? When people describe something as being “more of an art than a science”, what do you think they really mean? I have no idea what they mean, but I can tell you what I think. Art is emotional intelligence which is much more evolved than the rational left-brain activity of science. The best science, pure science, is always high art. Even when you think you might know everything there is to know about a crime, there are always surprises waiting in store. How much of a factor is luck when it comes to solving a mystery? Do you believe people create their own luck? Two very different questions — how do I get them to cohere? The best answer can be found in P. G. Wodehouse’s treasury of aphorisms: Being rich means having a new shirt, a new hat, a perfect crease to your trousers, and matching socks — all at the same time. It’s the same with crime: You have to have all the right answers at the same time. I would answer this so much more fully if it didn’t come so close to the plot of the next Lalli book. Has anyone ever described Lalli to you in a way that made you look at her in a new light? Yes, after the second book I was surprised by the interest in her wardrobe. That got me interested enough to discover her adventures in haute couture — you’ll have to wait a bit for that book. Colonel Sebastian Moran: Ah, the air gun chappie. Small time goon, really. Humourless villain, richly deserved his fate in The Empty House. Perry Mason: Smart but tedious. Nancy Drew: Makes good cinnamon toast. Doctor Who: Never met him. An excerpt from your next Lalli mystery (I Never Knew It Was You) is included at the end of The Monochrome Madonna. Have you already finished writing the novel? What can readers expect from it? Anything you’re willing to let slip just yet? I’ve just let Chapter One slip! Yes, the book’s done, and it’s all you can expect from Chapter One. The reader has the last word, always — and the writer wants to hear it! Good interview. And dude…I wanna hear you play the piano.